Following a discussion this blog in response to my recent ‘Safe’ routes to school – no pavements and unlit at 60 mph? blog post, here are examples of rural speed limits in Holland in the the UK. Notice that many Dutch rural roads have 50 mph speed limits (purple) and 40 mph (red) rather than 60 mph (light blue) or dark blue (70 mph). Across the North Sea on the east coast of England all rural roads are 60 mph, no 50 mph speed limits at all and very few 40mph limits. The speed data is from OpenStreetMap and has been visualised by ITO Map. The speed data is not yet complete If you are able to help please then please add information to OpenStreetMap for your area and places that you visit. 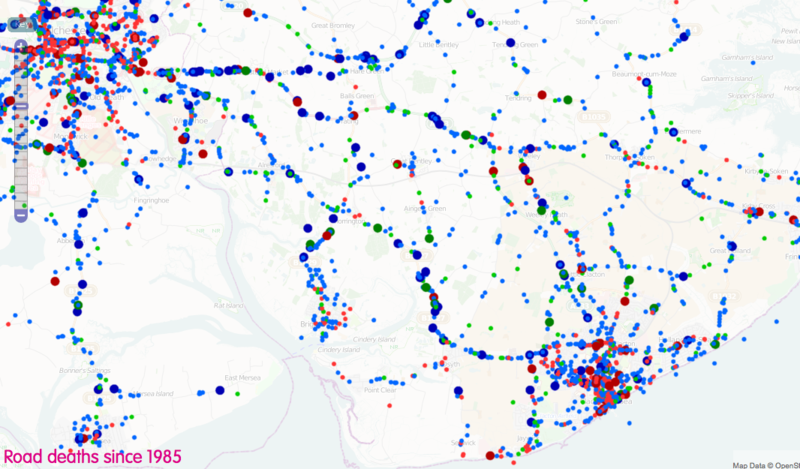 This final image shows pedestrian road casualties for Tendering District since 1986. Large blobs are deaths, small ones are serious injuries. Red for pedestrian, blue for driver, green for passenger. Most pedestrian casualties are in the towns, which is likely to be for two reasons – firstly that most pedestrians movements naturally take place in towns and secondly because pedestrians avoid rural roads knowing that they are unsafe. Casualty data from Stats19 police data. Do remember that road deaths have fallen massively since 1985 when some 5,500 people were killed in GB compared to 1,857 last year. ← ‘Safe’ routes to school – no pavements and unlit at 60 mph? That’s very good map data Peter. But I have to note one thing in your description: Dutch roads equivalent to British A roads never have a limit greater than 80 km/h, and often have a limit of 60 km/h. Roads with A-numbers in the Netherlands are motorways. N-numbers are national routes, and likely to be autowegen. All the light and dark blue roads on your map in the Netherlands are either snelwegen (motorways) or autowegen. Both these types of roads never have anyone walking or cycling along them. It is illegal to do so, just as with motorways in the UK. They also take routes distinct from walking and cycling routes, just as do motorways in the UK, and there will always be a good route to take by bike or with slow vehicles which are not allowed on these roads. Snelwegen normally have a speed limit of 120 km/h. However, if they are near residential areas this speed limit will normally reduce to 100 km/h to reduce noise nuisance and improve air quality. Sometimes it reduces further, to 80 km/h, and inside a built up area it will never be higher than 70 km/h. Some parts of the Dutch motorway network had a recent increase to 130 km/h, but this change for petrol-heads was introduced at the same time as tightening up the allowance which the police make when booking people for speeding. The result is that while it’s now possible to driver at just slightly higher speed on just a few short stretches of motorway, the average speed that you can drive on Dutch motorways without getting a ticket actually dropped. Making these two changes at the same time was a very good idea. No-one complained. Autowegen have a speed limit of 100 km/h outside built up areas and 50 km/h within built up areas. Again, this is mostly due to noise and pollution concerns. These roads look rather like a British A-road but they have motorway style laws (no slow vehicles, bikes or pedestrians). There isn’t an exact equivalent in the UK. Most are one lane in each direction though some are dual-carriageways. A lot of effort has gone into reducing noise nuisance from large roads in the Netherlands, and it’s very effective. As a result of this, it is usually not possible to hear motorways from just a couple of hundred metres away. Wait, I’m not entirely sure why you think that so many of the N roads in the Netherlands are autowegen, you mean the ones with 100 km/h limits and that blue square and white car on them? Those are less common. They have a solid white edge line, a quite large clear zone or crash barriers, some even have crash barriers in the middle making them dual carriageways even if they don’t always have 2 lanes in each direction. Most N roads do have 80 limits, at least those with numbers less than 400 I think. These have double white lines with a gap between them, modern standards call for 80 cm with something in that gap, like a rumble strip or some sort of raised ridges at regular intervals, about 30 cm of asphalt on the outside of a broken white edge line, and even more modern practice calls for a non asphalt semi hard shoulder a couple metres wide and about 4.5-6 metres of a run off area. I’d actually like for these to be 70 roads, based on Swedish research that calls for limits of 70 on each non dual carriageway (even some high tension cables will do, although this needs 1.25 metres between the two directions and something more like the autowegen with their mostly grade separated nature) roads. Most of the countryside where it is for traffic within that local area, or maybe between a village and the city or town, are 60 roads, and even many 60 roads have separate cycle paths, which is where any pedestrian that does decide to walk is supposed to go. Cyclists and mopeds of course use the separate path as well. This is good data – although it doesn’t really support your argument as most (possibly all) of the pedestrian deaths are in areas where the speed limit is already 40mph or even 30mph. I accept your point about people not walking on rural roads but the fact that few people walk on these roads is one of the reasons for them having higher limits. There is also the point that, while speed is a major factor in how serious an accident is, it has little influence on the likelihood of an accident actually happening. In my view, speed limits do not help because they give drivers the false impression that they can drive at a given speed regardless of the time of day, weather, condition of the road and a number of other factors that determine the likelihood of an accident occurring. If we want our roads to be safer then we need to educate drivers to drive in a manner that is appropriate at the time they are travelling down the road.